We are a leading Manufacturer of corner twin seater whirlpool bathtub, rectangular whirlpool bathtub, rectangular single seater whirlpool bathtub, round four seater whirlpool bathtub and rectangular twin seater whirlpool bathtub from Mumbai, India. Owing to the presence of expert engineers, we have been able to offer a high quality Corner Twin Seater Whirlpool Bathtub. The offered bathtub is designed with the help of quality approved material and modular technology, in observance with set industrial standards. 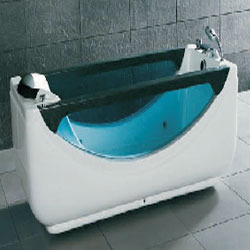 This bathtub is available various designs & sizes as per the need of clients. Our bathtub is checked on numerous parameters in order to deliver a defect free range from our side. 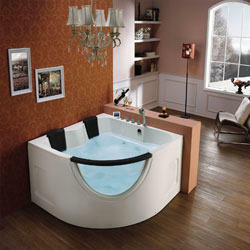 With our in-depth knowledge and experience, we are engaged in offering a premium quality Rectangular Whirlpool Bathtub. This bathtub comes with 6 hydro massage jets and back spinal massage jets. Our offered bathtub is designed with the help of premium quality material and advanced tools under the guidance of excellent professionals. 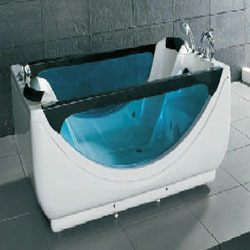 Customers can avail this bathtub from us on numerous sizes & designs according to their requirements. 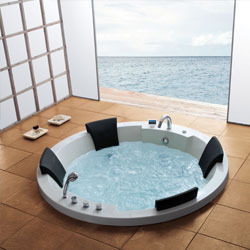 Our organization is indulged in offering an excellent quality Round Four Seater Whirlpool Bathtub. Our bathtub is featured with bath tub faucet with hand shower. The offered bathtub is designed as per the market norms using premium quality material and modular technology under the supervision of experts. This bathtub is accessible in various designs, sizes and shapes, in order to meet the vast requirements of our customers. 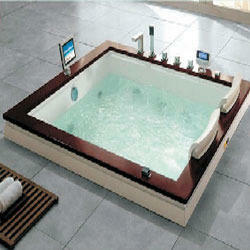 Our company is renowned in the field of the manufacture, distribute and import of Rectangular Whirlpool Bathtub. Manufactured by expert team using premium raw materials, these bathtubs are available in various specifications to cater to all expectations of the clients. Along with this, these have awesome quality and high durability for long period of time. To add on, these are highly appreciated by leading customers. 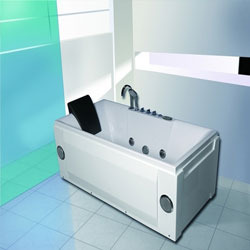 We are leading manufacturer, distributer and importer of Rectangular Twin Seater Whirlpool Bathtub. These are sourced by us from leading manufacturer who have expertise in successfully matching up with the rising expectations of the customers. These attractive range helps in making your dream bath spaces come alive that makes one enjoy the luxurious feeling as felt when surrounded by water. 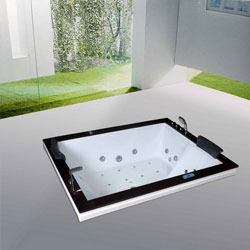 We are the leading manufacturer, distribute and importer of Rectangular Twin Slater Whirlpool Bathtub. 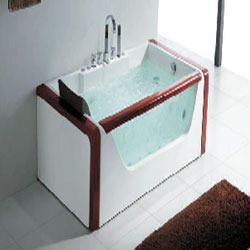 Our offered range is highly demanded among customers for their attractiveness and comfortable bath. 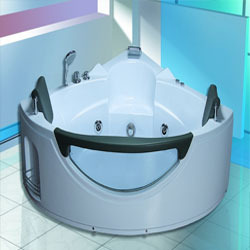 These bathtubs are manufactured by optimum quality materials which are sourced from certified and trustworthy vendors. Furthermore, these have excellent chrome therapy under water light and give superior performance. Looking for “Whirlpool Tubs Oxi Series”?